Tsion Yared returned to her 2A throne as the champion at Saturday's FHSAA state final. Yared looked smooth throughout the race, taking the lead and maintaining it throughout the duration. Yared finished in a time of 17:26.63 -- a huge course PR for the Pine Crest junior. Yared has had an incredibly strong season, setting four course records and six meet records over the past few months. She now has the top 2A state final time since the FHSAA changed the distance to a 5k, the previous record was set by Bolles alumna and Stanford athlete, Caitlin Collier, in a time of 17:44.20. What is most impressive about Yared is her ability to lead her teammates and encourage those around her to achieve their best. At the finish line, Yared was seen grabbing water for her teammates. She congratulated her teammate, Emily Faulhaber, who finished third in a time of 18:16. As the two girls made eye contact Yared said, "It's okay, we gave it our all." The Pine Crest girls then gathered around the Bolles girls and each congratulated one another on a strong finish. It was true sportsmanship from both the Bolles and Pine Crest ladies -- a tradition that has been a constant for many years now in class 2A. Yared led Pine Crest to their seventh podium finish in a row and claimed her third individual state title and their season is not over just yet! Yared and the Pine Crest girls will head to NXR in Cary, NC to compete for a spot at NXN in Oregon. Ben Hartvigsen returns as the 4A individual state champion in a time of 15:27 to be the fastest boys time of the day. After celebrating his win, Hartvigsen quickly turned his attention to the finish line where his Sarasota teammates were coming in one by one: Ryan Guendjoian (16:23), Alan Galicia Romero (16:26), Orlando Cicilioni (16:44), Shane Kilduff (16:48), Adrien Zambaux (16:57), and Anthony Bilotta (17:03). Anxiously looking at phone screens from media personnel and waiting for the unofficial team scores to be updated, Sarasota's name was smack dab in first place. They did it. The first team title in school's history. With 84 points to edge out Steinbrenner with a 16:21 average, it was a day for school records for the Sarasota squad. Just minutes prior to the boys race, the Sarasota girls had just finished second in the 4A girls race with 136 points -- another outstanding finish. The Sarasota girls were led by senior, Isabelle Jester, who ran a time of 19:01 to finish 16th. Jester along with teammates: Kasumi Wade, Marissa Kempf, Carolina Titus, Lucy Walter, and Camryn Wigglesworth ran a team average of 19:27 with a 1:18 1-5 split to finish second to Plant's 118 points. Charles Hicks defended his 2A individual title with a time of 15:29. This year he led the Bolles boys to a 21 point team finish -- to tie the record for lowest team score of 21 points set by Palmer Trinity back in 1986. Chase Rivera and Ben Foltz finished second and third in times of 15:41 and 15:43. Alexander Hastings and Kamren Khan finished sixth and eleventh to finish out the top 5. Freshman William Brady and sophomore Cole Rutkowski really stepped it up for the Bolles squad. Brady ran 16:21 to finish 16th overall to beat his previous state time by nearly 40 seconds! The 2019 squad finished up their last state meet and now they can center their focus on the top goal they have set since last year: get to NXN. 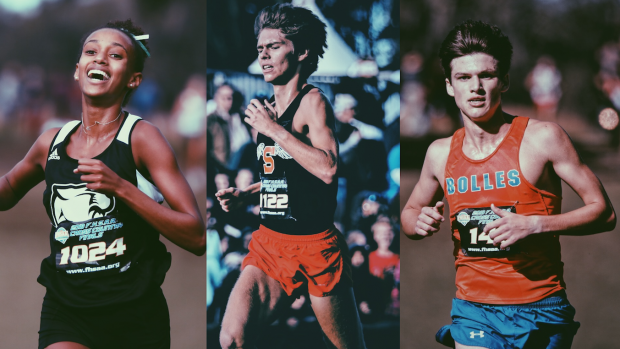 Bolles will join Belen, Pine Crest, Chiles, and many other top teams and individuals at the Nike Cross Southeast Regional in Cary NC next weekend.